+5 Attack; or +5 Health and Taunt. A total game-changer! One of my favorite cards! Instead of +5 attack, a +2 attack or health and Charge would be more useful. That way you can get immediate use out of it and have it also maybe survive another turn. 7 Mana 10/5 with charge is totally balanced. Right? No, it'd be a 7/5 with charge, or the 5/10 with taunt. Its still insane value. Doomguard is a 5/7 with charge but you've gotta discard 2 cards (Voidcaller being OP is a whole another story). Leeroy Jenkins guarantees his own death next turn. 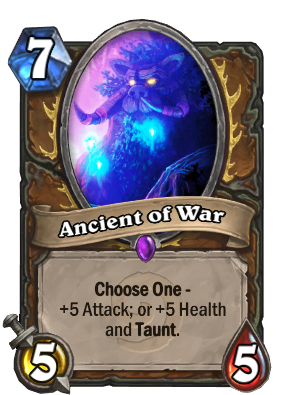 A 7 mana 7/5 charge minion with no downsides is crazy strong, more so considering Druid's ability to cheat the mana curve. I agree that the current attack form of AoW is bad and nobody uses it, but giving them more ways to put you below the infamous 14hp isn't the answer right now, considering Druid is one of the strongest classes atm. Hm, you are right. I am a casual player so I don't know all the values/worth very well yet. But still, would be nice to make the other choice better. Perhaps a choice between 5/10 with taunt or 5/5 with divine shield? Or a 7/5 with stealth? Eh, it doesn't matter I guess since they probably won't change it anyways. I thiink a 7/5 with stealth is a good option as you still get the extra damage and it won't die right away because of the stealth and can use it next turn. It'll also dodge a flamestrike. Or a 5/5 with divine shield and taunt, that way even with the smaller body, it can survive at least two hits unless silenced. Either way, I don't have any of these in my druid deck yet, wondering if its worth crafting one. I have all the other "essentials". Choose one: +5 Health and Taunt or BGH Bait! Stronger than Core Hound or Captured Jormungar as long as it doesnt get silenced. When silenced it still have the body of an Ancient of Lore ! + taunt if you choose the superior form! This has to be one of the better minions in the game! Well silence removes taunt doesn't it ?